My pregnancy cruised along with no major issues. At 25 weeks I found out after a scan that bub was breech. No big deal, there was plenty of time for her (though the gender was a surprise, but I'll use her for clarity) to flip. And even if she didn't I knew several women who had birthed breech babies, including my grandmother - twice. 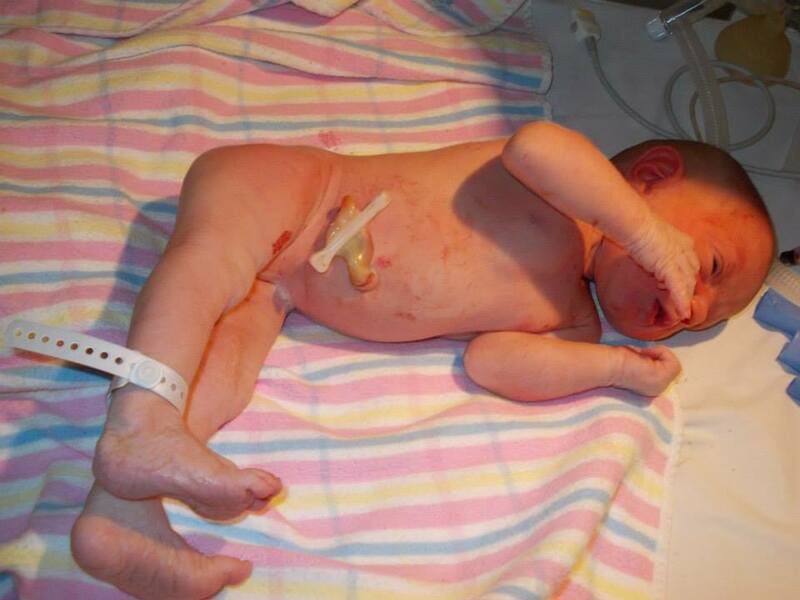 By 32 weeks when each appointment revealed that bub was still bum down I was starting to get a bit apprehensive as I knew our local hospital didn't like doing breech births and I would have a fight on my hands if I wanted to avoid a cesarean, which I most definitely did. I'm not good at standing up for myself. So I started doing techniques from Spinning Babies to encourage her to flip head down. Nothing worked. At 36 weeks an ECV was scheduled for the following week to attempt to turn her manually, but after going home and researching we decided to cancel the appointment as we felt it was too risky and as it couldn't be done locally that week it would have meant a three hour drive alone with my 16 month old and then a 3 hour drive back. I saw my chiropractor for the Webster technique. Between the second and third attempts bub went transverse for a weekend before resuming breech position. It was looking increasingly likely that she wasn't going to flip and while I wasn't worried about a breech birth and kept empowering myself by watching and reading breech birth stories I knew that the likelihood of being "allowed" a breech birth by the local hospital was incredibly slim. My options were pretty much limited to a caesarean locally, going into the local hospital in labour and hoping someone who had delivered breeches was working and refusing a caesarean, or a three hour drive to Newcastle where there was a breech clinic. We also toyed with the idea of a home birth but didn't think we'd find anyone available or afford one so close to the end. At my 37 week appointment the midwife was ready to schedule me for an elective caesarean (though how they can call it elective when they don't give you an alternative is beyond me). We mentioned how uncomfortable we were with that option and she said she'd have the consultant speak to us. Speaking to him helped reassure me that a vaginal birth wasn't a foolish desire, but while he himself didn't agree with the study that showed breech births to be unsafe he stood by hospital policy. My hope of at the very least being allowed to go into labour first and let my baby choose her own birthday before having a cesarean was also dashed. 39+3 was the latest they would allow me to go and I very reluctantly allowed them to put me on the books for Wednesday the 29th of May as I felt it easier to cancel it after solidifying an alternate plan. I did not want a caesarean and the six weeks of recovery time that comes with it - six weeks of not being able to carry my toddler, of not being able to drive. I did not want to have to fight for a VBAC for future babies. I would not let them cut me open just because my baby wasn't one of the 96% of babies who are head down at term. But I was also terrified of my other option, driving to Newcastle three hours away where my doula and student midwife wouldn't be able to be with me, with a chance I'd end up having a caesarean anyway and then be stuck recovering in a hospital away from home. I felt trapped between a rock and a hard place and I ended up having a panic attack. I spoke to my doula and she encouraged me to get in contact with an independent midwife which I did, and she arranged to come to my home on the Saturday when I was 37+6. Not surprisingly she wasn't bale to take me on as a client so late, but she did offer to come to my next appointment and speak to the consultant to find out if an arrangement could be made to have my baby locally and I felt so much better after speaking with her. Newcastle no longer seemed like a terrible option. At my next appointment the consultant agreed to let me have a vaginal birth if I went into labour that week, but beyond that there wasn't anything he could do except refer me to Newcastle. But my scheduled caesarean was taken off the books and that was a huge weight lifted off my shoulders. Not surprisingly to me I didn't have my baby that week. I was 39+4 at my next appointment and it was very strange to me to realise that under different circumstances I could already have been holding my baby in my arms as my caesarean had been scheduled for the previous day. I confirmed with the registrar that I would be delivering in Newcastle but I wasn't sure if the referral had been done so she called her consultant. The consultant greeted me with "so you're the one who didn't go through with the Caesar " and proceeded to tell me that Newcastle didn't do breech births any more. I waited for them to contact the consultant from the previous week who made arrangements for me to meet the head of the breech clinic in Newcastle the following day after having a detailed ultrasound first thing in the morning. On the Friday my mom drove me down to watch my daughter Saranna for the day. The doctor confirmed that I was an excellent candidate for vaginal delivery and affirmed their belief that breech is just a variation of normal and that as long as certain risk factors are met and the care providers are knowledgeable and experienced with breech births they carry no increased risks. He did recommend an ECV though, and while I was at peace with accepting that there was likely a reason for her being breech, after calling my husband and a lot of back and north texting with my doula I decided that I would have more regrets if I didn't try everything to give birth locally with my support team present. It wasn't successful but it also wasn't terribly painful or the least bit traumatic so that was all good. We went home in the late afternoon with a follow up appointment scheduled for Wednesday. Wednesday morning, 40+3, my mom, husband Jeff, Saranna and I headed back down to Newcastle with the car packed with bags for everyone for a week just in case. But I found the appointment a waste of six hours driving and felt like I was going to be pregnant for another week so I made the decision to just go home. After putting my daughter to bed I contacted my massage therapist and booked her earliest available appointment which was on Saturday, then I had a long relaxing soak in the bath and went to bed at 9, super early for me. At 11:30pm on 5 June 2013 a contraction woke me up. I chatted with some online friends for a while and by midnight had already had five contractions so decided with a three hour drive ahead there was no more time to waste. Jeff hadn't gone to bed yet and after I told him we should have stayed in Newcastle after all he asked if he could get a couple hours of sleep. Better not risk it though. I'd been timing my contractions and they were already 3-5 minutes apart lasting 45-60 seconds. Jeff called my mom while I went around getting last minute things ready, stopping to sway through my contractions and timing them on my phone. I was still in my robe when my mom showed up so I quickly got dressed. We transferred my sleeping daughter to the car and were on the road by 1am. The drive wasn't as bad as I had thought it would be. Because I wasn't able to move with them I closed my eyes and breathed through the contractions, calm and focused. Timing them helped as well and they had gone down to 7-10 minutes apart, still averaging 45-60 seconds though some were longer. I phoned the hospital enroute to let them know I was coming in to get checked and then check into a hotel as I had ages to go yet. At 2am my daughter woke up and wouldn't go back to sleep. We arrived at the hospital at 4am and my contractions seemed to be closer together again bit I was no longer timing them but they still weren't very intense and I was certain I'd be a while yet. At 4:20 I had finished checking in and the midwives told me it was a good thing I wasn't in established labour yet as the consultant on call was the only one who doesn't do breech births and would have meant a caesarean. The doctor I had met was unreachable as well, having been called away to a family emergency in Queensland. I had a brief moment of panic at that news, but there was only three and a half hours until he was replaced so I wasn't worried for long. After situating me in a room and inserting a cannula and hooking me up to the ctg my contractions seemed to stop, of course. I did have a couple that the trace barely recorded and while they still didn't feel super intense I did feel like a bit of a wuss that they were barely strong enough to register - until I realised that the clip was on her head and being pushed up above my uterus with every contraction. It started picking them up as soon as it was repositioned. At 5:30 the registrar came in and checked means said I was 4cm dilated already. I wasn't going anywhere then, but as there was still a ways to go Lisa, my midwife, suggested we get some sleep and brought a pull out bed for Jeff and then said to call if I needed anything. I tried to lay down but was so uncomfortable I got on my hands and knees on the bed and swayed through contractions while Jeff went to track down my mom and Saranna. As Saranna had still not slept since 2am Jeff decided to lay on the pull out bed with her for a while and mom went down to the car to sleep. I was left to labour on my own from around 6am and I tried to stay quiet to let Jeff and Sara sleep, but suddenly I had three contractions that I needed to vocalise through and they seemed quite close together. I decided I needed something to take the edge off, maybe even an epidural, feeling like a wuss for needing drugs this time. I called the midwife at 6:20. I was mid contraction when she showed up and asked if I was feeling pressure and I said no but I needed gas and air. I hadn't liked it with my first labour and had only taken two puffs but thought it was worth trying again. After handing me the mouthpiece Lisa administered antibiotics through my cannula as I was GBS positive. I barely even sucked on the gas before tossing it aside - I needed to vocalise instead. After that contraction I informed Lisa that I was definitely feeling pressure and asked what would happen if I got pushy before 8. She assured me that she had 22 years experience and the registrars were comfortable with breeches. The consultant just wouldn't make it in time to have a say. Everything happened so quickly that I don't remember the order of events precisely but Jeff called mom and told her to wait outside my room for Saranna to be passed to her when she woke up and I'm not sure when the second midwife or registrar arrived, but the registrar asked me to turn over for a minute to check my progress and I announced it was too late, I was pushing. My waters broke and I could feel her descending and then her bum was out. It took a while for Jeff to come up and tell me it was a girl as she was so swollen he had a hard time recognising the gender. As her body emerged they kept asking me to raise myself higher and higher as she was so long. I was on my knees leaning over the upright end of the bed. I felt one leg unfold and flop to the bed but her second leg was gently tugged free after about a minute. I don't know if they stayed hands free or if they assisted with her head, but less than 10 minutes after I started pushing she was fully born. It was 6:50 am. We had wanted delayed cord clamping and immediate skin to skin but the NICU team (no idea when they showed up either) said she needed help as she was stunned and needed her airways cleared and we didn't insist. Jeff quickly cut the cord and a midwife helped me turn over and lay on the bed. My first glimpse of Chloe was on the resuscitaire on the other side of the room. They gave her to me for skin to skin as soon as she cried but took her back after about ten minutes to clear out her airways again. During that time I birthed the placenta naturally but I ended up on a syntocinon drip for 2 and a half hours as I passed several clots and lost approximately 700mLs of blood, though I felt completely fine. It wasn't until the following day that I learned I had ragged membranes and I had forgotten to ask to inspect the placenta and ask about the cord so I have no idea if she was breech due to a short cord or not. I only had a small graze and didn't need any stitches. Mom brought Saranna back in to meet her baby sister . After two and a half hours of skin to skin during which she breast fed a couple of times she was weighed and measured - 3.15kg and 54cm long. I then had a shower while Jeff dressed Chloe and we spent the afternoon asking to be discharged and they kept putting us off but finally we were allowed to go home at 8:30 when Jeff asked at reception what the ramifications were for just walking out. There was a three hour drive ahead of us yet and no one had slept and we didn't have accommodations for mom and Jeff and Saranna as they had kept saying we could go home. It was a long day but I was so glad to get to climb into my own bed with my family at the end of it.